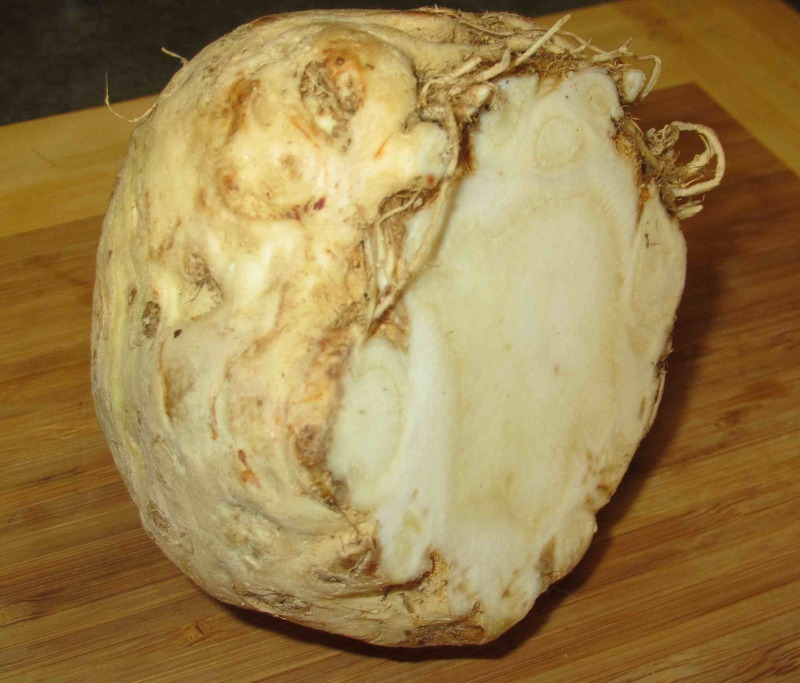 The inside of the vegetable is somewhat whitish and a cross-section slice has an appearance very like the cut surface of a large parsnip. The smell is also somewhat similar, although it doesn’t have the same sweetish notes, and is thus probably closer to a turnip as far as the aroma goes. Many people describe the taste as being like celery but I don’t agree. When you bit into a slice of the raw flesh it is quite firm, again like turnip, and the taste, I would say is like a cross between a very peppery parsnip and a slightly bitter turnip or mild radish. There is a hint of celery about it, but it is more the pungent bite of celery seed rather than the stems or leaves of the plant. The culinary uses of the vegetable are very diverse and can be put to all the same uses as a potato with the added benefit that it can be enjoyed raw. 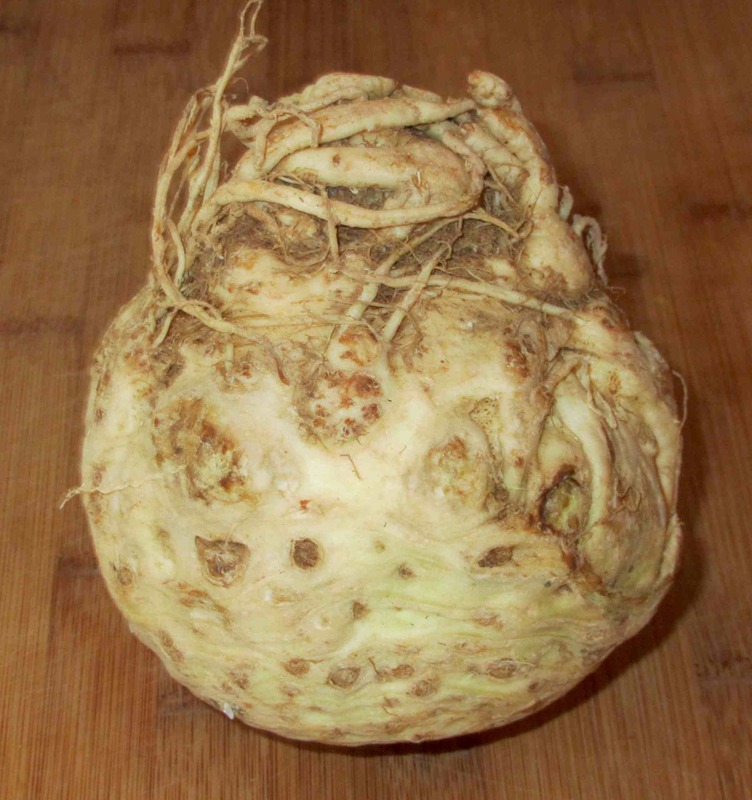 It features in many salads, especially the well-known ‘Celeriac Remoulade’, and is cooked in soups, stews and stir-fries. Another common way it is prepared is mashed, either alone or with potato, carrots, or other vegetables, where it can be eaten alone, as a ‘side’ or as a ‘bed’ on which other items may be served. Around here when the root is made into salad, it’s often combined it with apples and walnuts. And maybe a light yoghourt sauce to go with. Well…. I *did* do a salad with the one I had. Wasn’t a massive success but I will still post the results in a week or so…. apples might have been nice now that you mention it! The Dutch recipe for split pea soup that I use has cubes of this in it. I like to use it in place of mashed potatoes usually. I didn’t realize you could eat it raw, though. I’ll have to try it that way sometime. I see our ‘Arctic Ventures’ store has some more in stock. I like the split pea soup idea. That is just… wow! Looks like a character from a Tolkien novel. We love this and often use instead of potato. It’s expensive here in Portugal so I usually buy them and bring back with me from France. You can imagine the surpise of the customs guys when they scan the hand luggage. He pulled them out, looked at me quizzically? “They are expensive in Portuga”l I replied indignantly. He responded “Yes madam” as he tried to surpress a smile. LOL … you are lucky. In this day and age they might immediately arrest you as a terrorist! Yes, celeriac is a very versatile root veg. my favorite ways are in soup and stew. Have some growing in my garden at present, hope they do well this year. Oh, very nice! How long do they take to grow to useable size? I was fascinated to hear how someone sees Celeriac from a new person’s perspective as this is something I love to use in cooking. Raw it is great in salads but cooked it is something else again. Somehow it takes on all the flavours and accentuates them with a touch of ‘earthiness’ if that makes any sense… I would heartedly recommend it. The extra joy is that you can peel and dice it then freeze then take it out and add to a dish when you want. Celery root is one of my favorite things. I just adore it. My favorite thing is to shred it and make a celery root-wild rice gratin. Yum! I often mash it, then make small floured balls and fry them. Hmm… it is celery however. It is an indispensable vegetable in Polish kitchen, so please believe me. – seler korzeniowy (Apium graveolens L. var. rapaceum (Mill.) Gaudin) – what you call celeriac and some people celery root although it should be celery tuber or bulb (probably they are form Eastern Europe ;)); and we use its leaves too. – seler naciowy (Apium graveolens L. var. dulce (Mill.) Pers.) – what you call celery and we are using especially for salads, but not only, or instead of lack of celeriac. – seler liściasty (Apium graveolens L. var. secalinum (Alef.) Mansf.) – celery that doesn’t have the tuber only leaves – those leaves are in taste and colour the same like those from celeriac (darker green than in celery) – they don’t have a tuber but calmly you can substitute it without compromising the taste. It is probably some problem in translation for us, East Europeans, since ‘seler’ is celery and we don’t have other name for celeriac, only celery tuber 🙂 And we do have problem to buy it in other parts of the world where it is not common. Anyway, you have very informative and nice blog. I like it a lot and I like Chinese kitchen, too. Thank you … I had always been told that they were not the same. I am updating my post. We don’t use celery often. I like it but my wife doesn’t very much. You are welcome 🙂 I like it too. In Poland we add it to many soups as well and as an addition we are always being told not to add too much since it will take the lead and override other tastes.